This may be my favorite new recipe so far (30 before 30 list, #28). 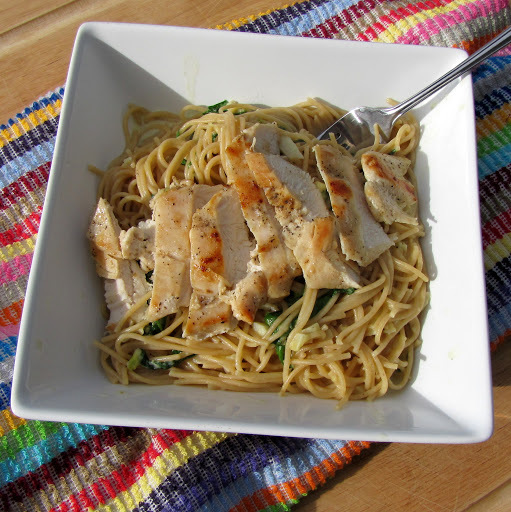 Skinny Creamy Garlic Pasta with Spinach & Chicken. I don’t remember how I found this blog/recipe – probably Pinterest, but it sounded delicious and easy (big plus). I made it for myself and my family the night before my triathlon and everyone loved it. I added the mushrooms that she suggested too. I forgot to take any pictures of the cooking or the final product, but here’s the photo from the blog! Categories: Thrilling Thursday | Tags: 30 before 30, cooking, food | Permalink.